The origins of the Assisi festival of Calendimaggio, the equivalent to Walpurgis Night, the eve of May Day, are related to the ancient customs of many different European peoples, and especially to the Roman celebrations known as the "Fasti di Maggio" and to the mediaeval tradition of celebrating the arrival of Spring in early May (Kalende di Maggio or Kalenda Maia in the mediaeval latin lyrics) with groups of revelers serenading through the streets of the town. 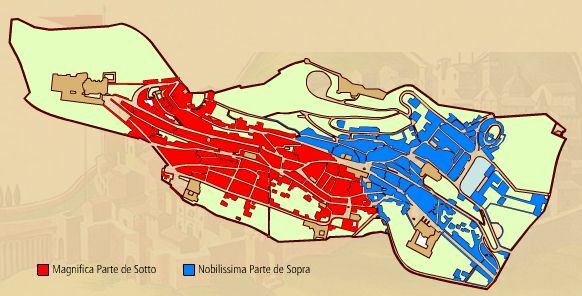 A more recent historical background to the festival is the long-standing rivalry between the "Upper" and the "Lower" parts of Assisi. This can be traced back to the protracted and bloody feuds for supremacy between the Nepis and the Fiumi families who were the leaders of the two warring factions. The feuding began in the 14 C and continued unchecked for over 200 years. So deep were the divisions that towards the middle of the 16 C, the Papal Governor, Giovanni Andrea Cruciani, was obliged to re-organise the town into three districts to keep the factions apart. Calendimaggio opens with the ceremonial handing over of the Keys of the City to the Master of the Field by the mayor, who thus confers on him supreme authority for the duration of the celebrations. Each side has its own beautiful candidates for Festival Queen and the winner is decided during a contest of mediaeval games. The champion obtains the privilege of proclaiming his lady to be "Madonna Primavera". In her honour, the flag-wavers then display their skills and the Minstrels sing Troubadour songs. Territories of the "Magnificent Parte de Sotto" and the "Right Noble Parte de Sopra"
After the challenge and acceptance have been read out in the Piazza del Comune, the "Magnificent Parte de Sotto" and the "Right Noble Parte de Sopra" both retire to their own neighbourhoods and costumed figures parade through the narrow streets and the squares to the sound of lutes and serenades, illuminated by flaming torches during the evening processon. 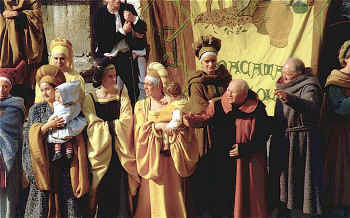 During the processions, the progress of the nobles alternates with the passage of gangs commoners, along with jesters, minstrels and singers, trumpeting and drumming. 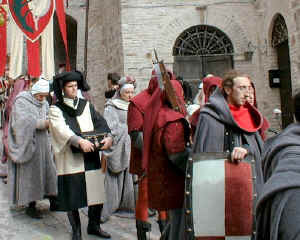 The "encounters" between the opposing sides take place in the Piazza del Comune in a spectacle of colour and banners. 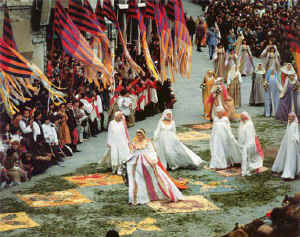 On the final evening the choirs of the sides compete before the spectators and the judges who award "Palio" to the winning choir. • Full-day excursions to Arezzo, Sansepolcro, Anghiari, Cortona. • Full-day excursions to Urbino. • Full-day excursions to Assisi and Spello. Click here for more information about Maurizio's minibus service. Assisi Information © ammonet InfoTech 2006 - 2018 All rights reserved.